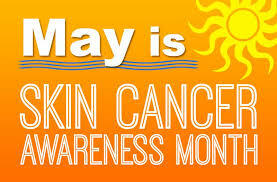 In May, as Summer approaches, we share information about Skin Cancer and how to decrease the odds for developing it. Between 1987 and 2002, in Puerto Rico, there were 1,568 new cases of melanoma reported. In 2012, in the United States, 67,753 people were diagnosed with melanoma and 9,251 people died of the same condition. Melanoma is the third most common skin cancer and the most aggressive type. Anyone can develop this type of skin cancer. However, some people have a higher risk of developing it because of different factors: having fair skin, freckles, a family history of skin cancer, having blue or green eyes, and red or blond hair. The most important preventable risk factor for developing melanoma is exposure to ultraviolet light (UV), either by direct sunlight or using tanning beds. Ultraviolet light is a type of radiation invisible to the human eye, which has the ability to penetrate our skin, causing changes in our skin cells that could promote the development of cancerous cells. When your sun exposure has been excessive, the skin becomes irritated and becomes red, loses elasticity and in some cases, the cells die, creating a layer of dead cells that eventually peels off although sometimes it takes weeks to heal the affected area. Being aware of changes in your skin can help you identify the possible development of skin cancer. The Cancer Registry reported that in Puerto Rico, during 2000-2004, the most common places in the body of melanoma were the lower extremities, followed by head and neck, torso, and finally, the upper extremities. If you've noticed a mole that was not there before, or a change in the appearance of a mole that you already had, you should implement the ABCDE of melanomas. Are the two halves of the mole different? Does it have an irregular border? Does it have a diameter greater than 6mm? Has it changed in recent weeks? If the answer to any or all of these questions is yes, or you have any concerns about changes in your skin, contact your doctor or dermatologist to answer your questions and make a proper assessment. You should not only learn to identify possible skin cancer lesions but also take an active role in protecting yourself against the sun’s ultraviolet rays. One option to protect yourself is to use sunscreen, but perhaps you are not sure about which kind of sunscreen to use. The main requirement is that the sunscreen used be “broad spectrum” with an SPF of 15 or higher and that it protects against UVA and UVB rays. Use long-sleeved clothing if you’re going to be in the sun for many hours. Avoid the sun at noon. We live in an island of eternal summer so completely avoiding sun exposure is not a viable option. Nor is it recommended since exposure to sunlight in moderation has its benefits. When sunlight interacts with cholesterol in the skin cells a biochemical reaction takes place which results in the synthesis of vitamin D. The latter can be obtained from the food we eat,depending on our diet, but moderate sun exposure helps maintain a healthy level of it. To stay out of risk of developing skin cancer, you can learn about the effects of excessive sun exposure and implement the simple protective measures outlined above. Valentín SM,Sánchez JL,Figueroa LD,Nazario CM. Epidemiology of melanoma in Puerto Rico, 1987-2002. PR Health Sci J. 2007 Dec;26(4):343-8. Irizarry-Pérez, M., Pérez-Laras, L.R., Restituyo-Rosario, A., Ortiz, A.P., Perez-Irizarry, J., Torres-Cintrón, M., Figueroa- Vallés, N. (2011). El Cáncer en la Piel en Puerto Rico. Registro Central de Cáncer, Centro Comprensivo de Cáncer Universidad de Puerto Rico. Vol 4 (Num 2).